New Zealand hard rock act LIKE A STORM have just announced their December U.S. headline tour today. The band, best known for innovating the use of Didgeridoo with heavy rock, will hit the road with direct support from PALISADES starting on December 11th in Lincoln, NE and will wrap on December 22nd in Las Vegas, NV. Fans can purchase VIP and general admission tickets on the band's website www.likeastorm.com. "We can't believe it's been over two years since our last headline tour of the U.S, so we're super excited for this run," says bass guitarist Kent Brooks. "We're riding high off the awesome summer tour with GODSMACK & SHINEDOWN, and this headline tour is gonna be the biggest and best show we've ever done." 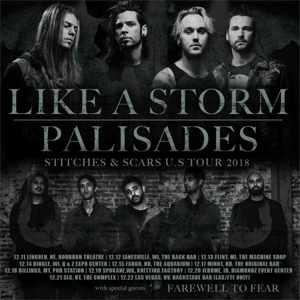 LIKE A STORM will be touring in support of their brand new single, "Complicated (Stitches & Scars)", off of their third studio album, Catacombs, which was released this past summer via Century Media/RED MUSIC. The record, which debuted on the Top 5 Billboard Heatseekers Charts, Top 50 Billboard Emerging Artist Charts, and Top 100 Billboard Album Charts, was produced by LIKE A STORM's very own Chris Brooks, Matt Brooks, and Kent Brooks. Hailing from Auckland, New Zealand, LIKE A STORM is the most successful New Zealand rock band in US radio history. First gaining notoriety for incorporating the Didgeridoo into their breakout track, "Love The Way You Hate Me". The band's last 6 singles, "Love the Way You Hate Me", "Wish You Hell", "Become The Enemy", "Break Free", "Pure Evil" and "The Devil Inside" have all charted at US Active Rock Top 40. LIKE A STORM has toured the globe with some of the biggest names in rock - including ALTER BRIDGE, SLASH, OZZY OSBOURNE, SHINEDOWN, THREE DAYS GRACE, on top of headlining North America extensively. They have also been invited to perform at the world's biggest hard rock festivals including: Download (UK), Nova Rock (Europe) and Rock on the Range (U.S.). Their reputation for touring the world relentlessly led Myles Kennedy of ALTER BRIDGE/SLASH to once label them, "The hardest-working band in the business." LIKE A STORM recently wrapped a massive U.S. run supporting GODSMACK & SHINEDOWN, where their high-energy live show garnered thousands of new fans on social media. Sully Erna from GODSMACK invited LIKE A STORM up on stage to perform a cover of AC/DC's "Highway to Hell" at their final show in Texas.